Housed in a stunning slipcase are two Australian albums, "Rock 'n' On" volume 1 and volume 2. In the late 1980s these albums where released on CD, but the sound quality was not great, and they did not have the original artwork. These cd's are very hard to find now. Now, for the very first time, both volume 1 and volume 2 are released in a 6 panel digipack with the original artwork from the original vinyl releases ! And.....each volume contains lots of hard to find outtakes and alternate versions ! 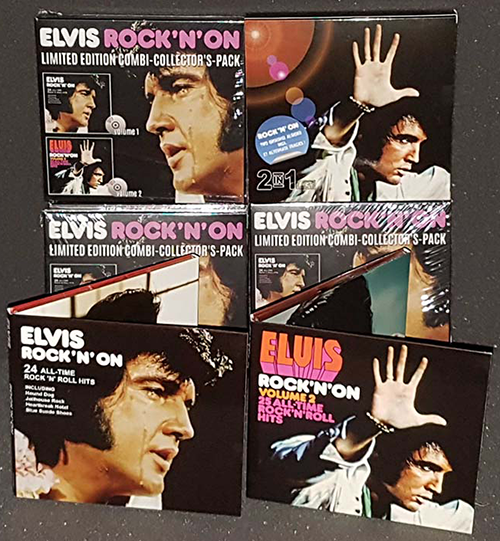 A superb collection for every Elvis fan. The perfect christmas gift !